OMG - this was so good. A bit sweet, a bit garlicky, a lot delicious! Wow - roasting vegetables is awesome. First it was the roasted beets that blew me away. They have now become a regular rotation in our diet. Now its the cauliflower. Yum, yum, double yum. Who knew cauliflower was a bit sweet (okay - maybe I'm a bit deprived of sweets) when roasted. If you have given up (or want to give up) white potatoes then you will probably start buying more cauliflower. It works awesome as a replacement for mashed potato's - such as in my twice baked mashed cauliflower recipe or cauliflower shepherd's pie. But we have been eating a LOT of cauliflower and I wanted to try something different - so I roasted it. Good call Mama, good call! This recipe is so easy. And I think the left-overs would be great in a salad. If you have any leftovers. Good luck with that. I did have to cheat a bit and use some Hidden Valley Ranch - okay - not 100% clean but only 4 tablespoons for a whole head of cauliflower. And I was low on time - and we all have to pick our battles. So feel free to make a home-made batch of ranch if you have the time. I will probably try this again one day without the bottled stuff and will let you know how it turns out. In the mean-time you can rest assured this is a great low-carbohydrate, clean"ish" way to get your veggies. And it smelled incredible baking - hubby thought I was making garlic bread. Ha, ha, ha. No such luck my friend! Preheat oven to 350 degrees. 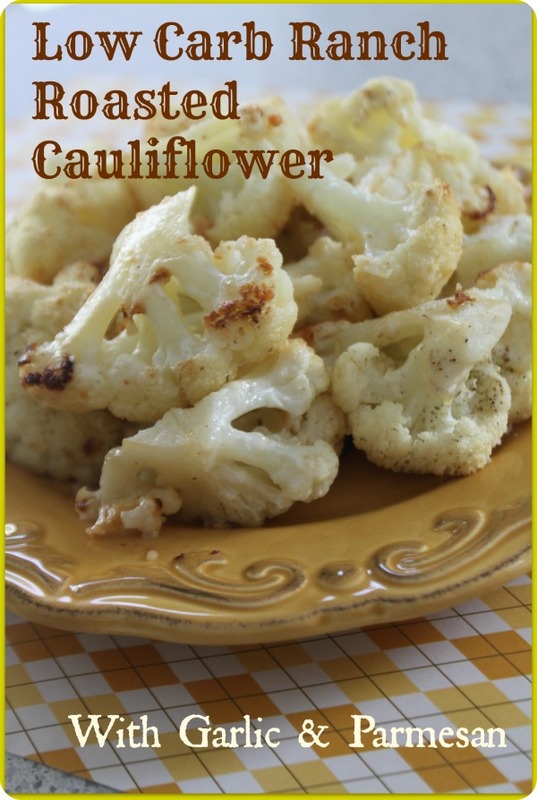 Wash cauliflower and cut into florets. Melt butter in microwave and add Ranch and garlic. Mix thoroughly. Put cleaned cauliflower florets in a mixing bowl. Pour Ranch mixture over top and combine thoroughly so the dressing is well distributed. Put cauliflower in a 9 x 13 greased glass dish (I used EVOO to grease) and sprinkle with salt and pepper. Cook for 20 minutes and turn. Increase heat to 425 degrees and cook for an additional 10 minutes. Sprinkle with Parmesan cheese and bake for another 5 minutes. Serve. Yum. Yum.Yum. I was baking something else at the same time hence the change in temperature. But it would likely work at whichever temperature - just adjust the length and keep an eye on it.